Economists are always interested in tracking the economic progress of countries around the world. However, that’s a difficult thing to do in undeveloped countries where records are rarely kept. Many countries do not even appear in the Penn World Tables, one of the most trusted compendiums of world economic data. Researchers at Brown University think that they’ve come up with an ingenious way of tracking the gross domestic product (GDP) of developing countries: they’ll do it from space. As odd as it sounds, it makes perfect sense when you understand the method. 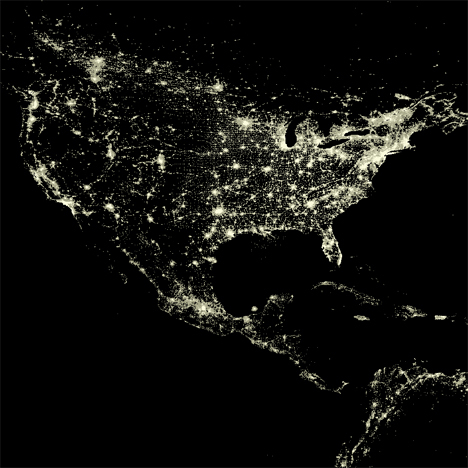 Economists J. Vernon Henderson, Adam Storeygard, and David N. Weil suggest that satellite images of nighttime lights can give clues as to an area’s income. 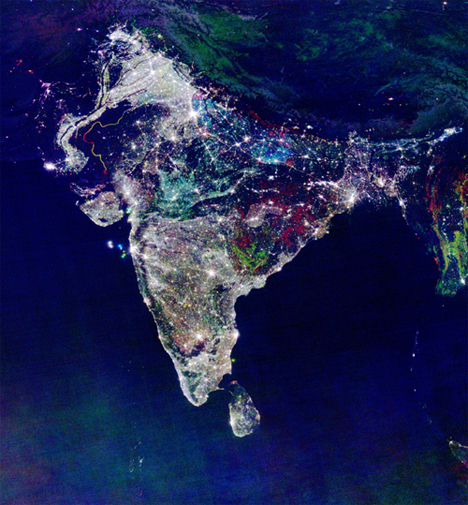 They propose using known economic data along with changes in the country’s nighttime lights to estimate the economic growth of the area over a period of time. Since consumption of just about any goods requires the use of lights at night, their report says, the light output is the ideal way to measure how much wealth a country is gaining. The method isn’t perfect, and it’s not meant to replace actual numbers. Rather, it is most effective when used in combination with official reports of economic status. 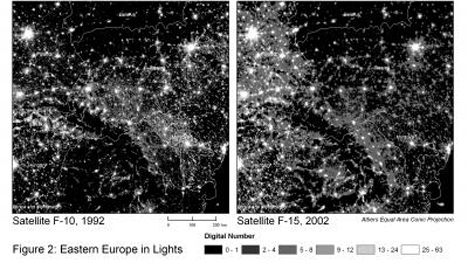 Using nighttime lights to measure the economic growth of a country has been used experimentally with mixed results, but obviously having any estimate is better than having no data at all. See more in Space & Time or under Science. October, 2009.